The study of working memory capacity is of outmost importance in cognitive psychology as working memory is at the basis of general cognitive function. Although the storage capacity limit has been thoroughly studied , its origin still remains a matter of debate. Several neurophysiological studies suggest that items are maintained in working memory through elevated firing activity in cortical neural assemblies that selectively respond to specific stimuli. Accounting for this experimental observation, Edin et al. proposed a mechanistic explanation of the top-down control of working memory capacity and, based on a mean-field analysis, established an upper boundary to the number of items that can be held in memory. By also making use of a recurrent network model of working memory , we have further investigated the mechanisms underlying working memory capacity while also accounting for the two following experimental observations: 1) visual saliency reduces the number of items that can be held in working memory, and 2) visually salient items are commonly kept in memory in delay match-to-sample tasks at the cost of not keeping as many non-salient items. Theoretical prediction of the performance derived from computational simulations of a delayed match-to-sample task with n selective neural assemblies simultaneously stimulated. 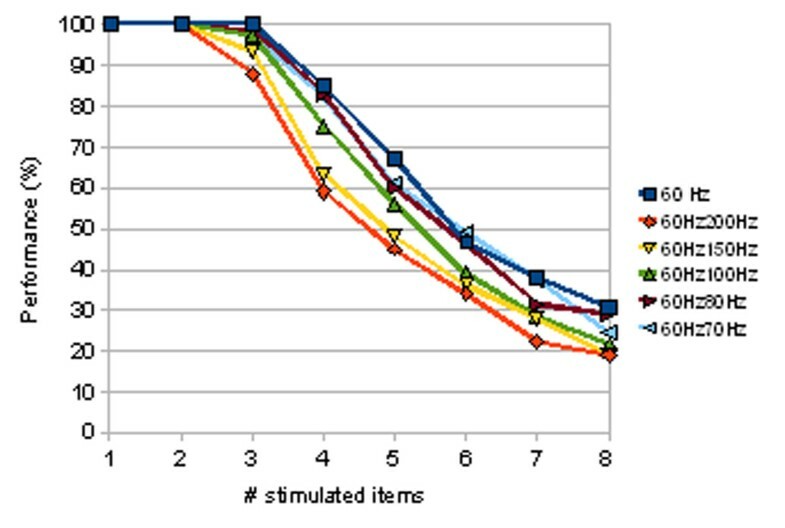 Performance is calculated by assuming that an item is held in memory when its associated selective pool shows a mean persistent activity νthres ≥ 20 Hz during a period of 2 s after removal of the stimuli. n-1 selective pools are stimulated at λ = 60 Hz and the remaining pool receives a higher stimulation λsal that emulates visual saliency. λsal = 60 Hz (no saliency), 70 Hz, 80 Hz, 100 Hz, 150 Hz and 200 Hz. The results are derived from computational simulations of a biologically plausible network of spiking neurons . A severe limitation in visual working memory capacity arises from the constraints that lateral inhibition imposes to the mnemonic activity during the delay period. However, it is also worth noting that a further limitation to working memory capacity derives from the need that the neural assemblies which have received stimulation reach a sufficiently high level of excitation. In particular, in the presence of visual saliency, the neural assemblies that receive stimulation but are not selective to the salient stimulus are less likely to achieve the elevated firing rates required to be subsequently held in memory.